Penang, Malaysia is a wonderful area for family travel. 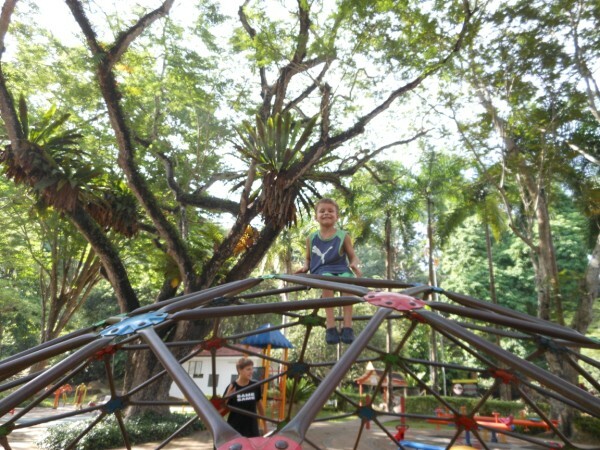 There are so many fun things to do in Penang with kids that we really enjoyed our time there; great food of all sorts, large malls offer shopping, movies, and more, beaches for lazing the day away and numerous cultural areas to explore. So many great things to do that it can be overwhelming when you only have a week or so in the area. We spent quite a bit of time in Penang recently so I thought I would put together a quick list of the top 10 things to do with your family. I am not usually one to spend time or money at a butterfly garden set up for tourists. After living in Costa Rica for 5 years and seeing so many amazing butterflies right in our backyard it seems like a moot point to us now. But when some friends visited and wanted to go I figured why not? I am so glad we went! Hiking, swimming, and exploring the wildlife, this park has it all. Penang National park is easy to access via the bus and offers so much in the way of outdoor fun. Pack a picnic lunch and eat along the water, watching monkeys scurry around you, take a leisurely stroll throughout the well maintained paths, explore the fishing docks and floating villages, or hop n a boat and explore the park from the water. If outdoors activity is what you seek then in Penang this is a great spot! If you have time try and do a day trip to Turtle beach and Monkey beach. For $40 a boat load (seats 10-12) you can stop off at turtle beach to see the sanctuary there, almost always complete with adorable baby turtles waiting to be big enough for release. At the opposite end of the beach you will find a walking trail and a mecromitic lake, one of only 19 in the world. But beware there are many jellyfish in the water here so don't bother swimming and the lake is only worth seeing in the rainy season. After that you will be taken to monkey beach where the swimming is much nicer and true to its name you will be overrun with monkeys. Tip: Bring in plenty of water and snacks as there are no services inside the park and it gets hot in Penang! (Monkey beach does have some vendors with cool drinks available) Also be careful on Monkey Beach, the monkeys will stalk you, wait for you to step away a bit and steal any and all food available to them! Typically, temples are not the most family friendly places, you need to be respectful and quiet and typically not run around screaming as my little ones seem to really enjoy particularly when it is most embarrassing! Kek Lok Si is different in that it seems a bit more relaxed. Tourist stalls adorn the entire complex and although that usually gives me less of an authentic feel it also lets me know they are slightly more relaxed. 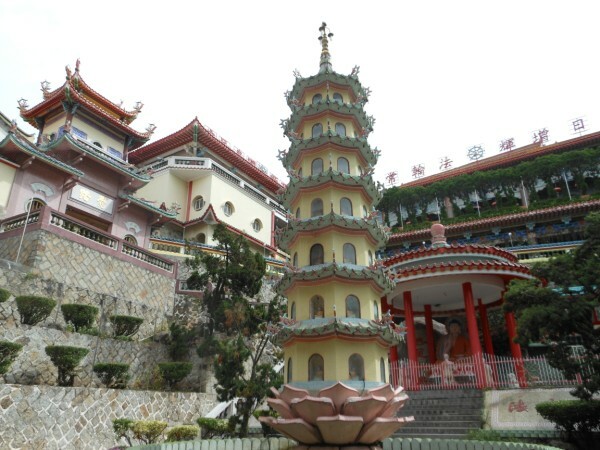 Respect needs to be observed still but there is lots of opportunity for fun - vehicular elevators, animal statues for posing and climbing on, ponds full of koi, and a great turtle pond are just a few of the attractions on the temple grounds to both impress and keep your little ones entertained. Tip: This is still a temple so be sure to dress appropriately. Cover knees and shoulders! You do not need to be a guest at the Hard Rock in order to enjoy the fabulous pool facilities. If you are in Penang for an extended period you can also buy a family pass for under $300, good for 4 people for the entire year. It allows free entry, discounts at the spa, shops, and restaurants, a well as a complimentary night at the hotel. It is well worth the money even if you stay only 6 months. There is also a kids club and teen club that you can enjoy free of charge when you buy the family pass. Tip: Bring in snacks and drinks of your own. I've never had anyone tell me I can't and it saves a fortune as the restaurants are exorbitantly priced. There are also many local restaurants right across the street so you can easily leave and come back. If your children enjoy reptiles this is the place for them. The temple itself is really nothing special but the thrill of spotting snakes all over the property is. I was a little nervous when we decided to check it out but the snakes all seemed quite sleepy and none were directly in our paths so it never seemed dangerous. The snakes can be spotted at different areas of the actual temple but outside was even more fun. A beautiful garden can be found and we spent nearly an hour searching the bushes to spot the colorful snakes, all of which appeared to be vipers. If you have the time head over to the small museum where you can see large cobras, some monkeys, a beautiful albino python and perhaps the biggest snake I have ever seen, a reticulated python that measured over 20 feet long and I am quite sure could swallow my 5 year old whole! Shaking with fear...check! Tip: Get some drinks outside the temple or bring your own as there were none for sale inside and it is HOT! Another great spot for outdoor fun is the Forest Park located near the Butterfly Garden on the Northern part of the island. Inside the park there is something for everyone. A forest museum showcases the types of plants and trees located on the island, 4 well marked walking trails weave throughout the 32 beautiful hectares, and a playground and swimming pools complete with slides make it a perfect spot to spend a few hours. Entrance to the park is free but the museum will cost 1 RM or roughly 30 cents. There are bathrooms inside the park but no services inside for food or drinks so bring your own. Tip: Bring bug spray as we got eaten alive! Tip: Read up on the history with your kids before going, it really puts the whole picture together better that way and in our opinion it was really fascinating stuff! Okay, this is not technically in Penang but as it was an easy drive from Penang and we all had such a great time I just had to include it in the list. 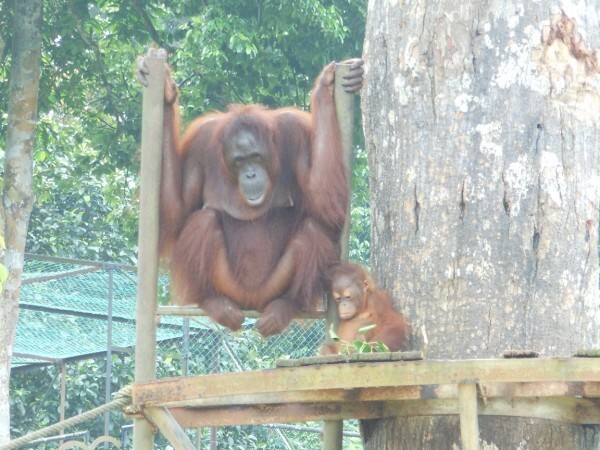 Orangutan island in Bukit Merah is doing some wonderful work rehabilitating Orangutans and slowly re releasing them into the wilds of Borneo. 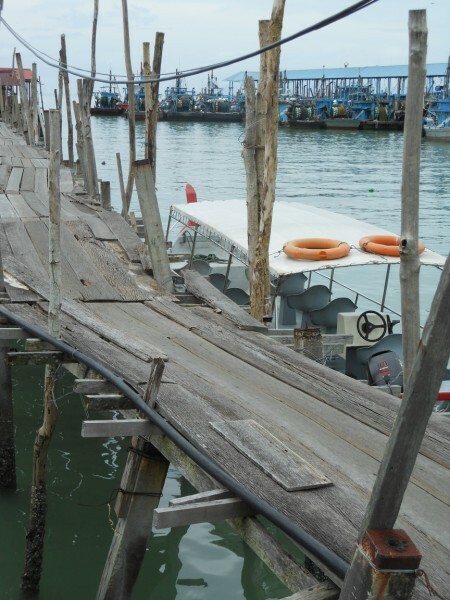 It took just 1 hour to get there from the Penang side of the bridge and it was a day full of boat rides, friendly knowledgeable tour guides, and amazingly close up encounters with orangutans of all ages. Tip: Head there early enough to enjoy not only the orangutans but also the wildlife parks and water park that is located in the same area. As far as free parks go this one has got to be top of the list! Huge playgrounds, skating park, paths for biking or jogging, pools for swimming or wading, and a beautifully landscaped park can all be enjoyed free of charge from dawn until dusk. Even when it is hot so much of the park is covered with beautiful trees providing shade that it makes it bearable. When not sightseeing this is a great spot to take the kids to burn off some steam! Tip: Be aware of monkeys and do not eat or carry food anyplace that you see them around! They can bite so avoid them and if bitten get to a doctor as soon as you can! Penang can get really hot! So if you want to beat the heat, or are facing a rainy day then Adventure Zone, in Batu Ferringhi, Penang, is your best bet. There are slides, rope challenges, a toddler area, video games, and fun for every age range. Plus there is free wifi in the lobby with nice tables and chairs so you can catch up on work or choose to go in and play along with the kids. There is also a Segway course outside for an added cost and a small cafe inside serving drinks and snacks. A great way to spend a couple hours! Tip: To save some money, bring some food or water in with you. I wouldn't bring a complete meal ,but water and some granola is fine. Also, do not go on the weekends when it is more busy and the fee for entrance increases. If you have extra time and the kids are up for it there are also several beaches to relax on, great shopping in Georgetown (Little India), fruit and spice gardens, and numerous other temples (Burmese temple on Burma Rd is one of our favorites) and mosques (floating mosque) to explore throughout the island! Do you have any tips of great spots for families in Penang? If so please share below! Never really thought much about traveling with the family to Malaysia, but you've changed that with this post. Orangutan Island looks wonderful along with the other outdoor opportunities you mention. We're not quite ready to travel outside the US yet, but we'll have to add one more place to our to-go list! I am so glad! Malaysia was a real surprise to us as well. It was a last minute addition to our trip and I am so glad we did it. Wait until you see how amazing Kuala Lumpur was! I swear if I had to pick a city to live in that would be on the top of the list. I am so glad! The hard rock is fabulous, I am sure your son will love the kids club and you can enjoy a bit of a break! Have a great time and be sure to message me any questions you may have. Really a very good information on penang malaysia trip topic. Thanks for posting and sharing. Thanks, we love it here! KL too..heck all of Malaysia really! Penang is one of most beautiful places to visit. Hope you have enjoyed your holiday to the maximum. Nice pictures. We were in Penang with our 3 (then) children back in 2001 and loved it. Spent 3 months and I recognize many of your places here. Planning on heading that way this summer -- July 5-Aug 15 or so with 7 (g), 10, 18 and 23 boys. Can't wait! Have a great time. I would be interested to see your thoughts on how much the island has changed over a decade! Yes, Penang is a wonderful place for a family travel. You can find many enjoyable places there. Nice post with very good explanation. I used to travel to Penang for our yearly Christmas holidays in the 70s and 80s with my parents, but haven't been back since about 1985. I'm heading back to Penang in June with my partner and our two kids (boy 10 and girl 12) for a trip down memory lane! It will be amazing to give my kids the experience of Penang that I enjoyed for so many years as a child...Can't wait! Oh no, they must have done away with that option. Well plenty of other fun things to do! You could stay 1 night and get 2 days free to play, but it is an expensive place! We love Penang and are planning to head back again in April next year. My kids just love the adventure zone you mention in the post. Thanks for the great tip to save money. Would they allow to bring water into the playing zone? Looking to hear from you, and thanks for sharing the post. Yes they do. I mean I don't make a show about having it but no one has ever said anything to me about it:) You have to keep it in the parents waiting area. Hi Bohemian! I also live in Penang! My family enjoys making Batik's in Batu and going to Escape. In fact we love Escape so much that we bought the yearly pass! It really is a great ropes course adventure for those that have older kids. Hi Bohemian! We also live in Penang. My family loves creating Batik's at the outlet in Batu and now that they have moved to their new place it is a lot more attractive for tourists! Also, we LOVE Escape, the new ropes course park! My kids kinda liked doing the Georgetown walk and finding the metal work sculptures--I think the heat was really the only set-back! But it is a really cool place for tourist to take photos and "see" Penang culture. Escape had oly just openede when we left but I bet that is a really fun place. I believe your kids need to be at least 10 though to really enjoy it right?! The heat was the whole problem for us there, otherwise its great. But for me if I am hot I feel trapped inside the ac and I never like that. Just arrived in Penang on our yacht with our three boys. Anchored off of Georgetown. Thanks for your ideas. Looking to have some fun here in the next couple of days! How exciting! How much time do you have?? Georgetown has loads of interesting things to check out! Maybe a bike cart ride around. Please update ... The Hard Rock Hotel no longer allows non-guests or members to use their pool facilities. Verified this today, much to the disappointment of my 5 year old! Oh no! That is such a shame. I will update the post now, thanks for letting me know. If you are there a couple months the pass would be well worth it! You even get a 1 night stay for free when you get the pass!